You are here: Home > Blog > Flora & Fauna > Unusual or exotic trees : the crab apple or wild apple tree. Throughout the U.K, there are various apple trees in our hedgerows and woodlands. Some of these are crab apple trees (Malus sylvestris), some are cultivated forms of apple (Malus domestica), some are Chinese Crab Apples (Malus hupehensis), some Siberian Crab Apples (Malus baccata) and others are hybrids somewhere in between. The Chinese and Siberian Crab Apples were sometimes planted by the Forestry Commission in and around picnic areas and conifer plantations. The wild /crab apple is part of our heritage and represents a source of genetic variation that might be used in future breeding programmes and / or conservation work. However, its future is uncertain - it is ‘disappearing’ from woodlands and hedgerows as it has been subject to hybridisation with the domestic apple (Malus x domestica). Over the decades / centuries , discarded apple cores have provided seeds which have given rise to ‘escaped’ domestic apples. 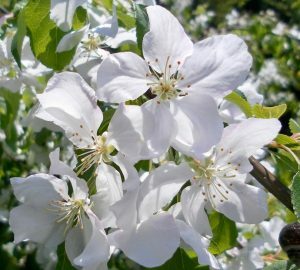 The flowers of these trees attract bees , bumblebees and other pollinators who transfer the pollen to wild apple flowers. In fact, it seems that all the Malus species found are capable of inter-breeding and hybridising. Apple orchards with domestic apples have been around for centuries - which is a considerable period in which the exchange of pollen with wild forms could have taken place. Recent work by Markus Ruhsam from RBGE and Rick Worrell (associated with the Forestry Commission, Scotland) has involved DNA analysis of wild apple trees in Scotland and Northern England. Their work suggests that the genetic make-up of ‘wild apples’ is quite complex. There are still ‘pure’ wild apples (Malus sylvestris) but there are also various crosses between wild and cultivated forms of the apples. Indeed, some 30% of what appear to be pure wild apples are, in fact, hybrids - with varying amounts of DNA from domestic apples. Upland areas of Scotland were identified as having a good representation of pure wild apples (e.g. the Southern Highlands, the Trossachs National Park and England’s Lake District). Hybrid forms were more often encountered in the farmed areas of the central belt of Scotland (where natural woodland is not so abundant). It would seem that mature wild apples are generally in 'good health' and to be found in ancient woodland, secondary woodland / wood pasture, in hedges and along railway tracks. However, crab apple seedlings and saplings are not often seen - so perhaps the opportunities for regeneration are more limited than in the past. The wild apple tree can have a broad crown; but it can appear more bush-like than tree-like. It can grow to a height of 30 feet. 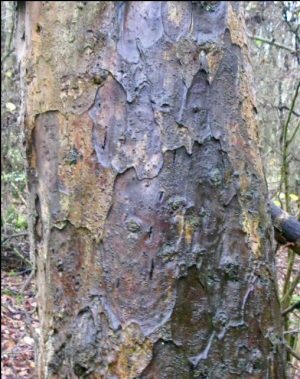 Its bark is a deep brown, sometimes with a purplish tinge and has a ‘scaly’ and ridged appearance. The shoots may have thorns / spines. The buds are brown, slightly downy at the tip. The flowers are white. The crab apples when formed are hard and yellow-green in colour. These fruits are very sour and acid; they often lie on the ground till they soften or rot when rabbits or deer might eat them. (though they can be used to make crab apple jelly) The tree is relatively long lived , circa 100 years. The native apple tree has a high light requirement and is not the most competitive of species. The tree is not common but is widespread being native to most European countries. 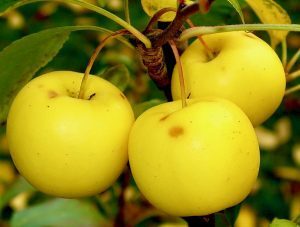 The domestic apple has its origins in the wild apples (Malus sieversii) of East Asia plus ‘contributions’ from other species from along the 'Silk Road' running from Asia to Western Europe. The European crab apple has been a contributor.